On a sweltering summer morning at the end of July, while the rest of us were soaking up all the air conditioning we could, three men were outside volunteering their time in the Indiana heat. 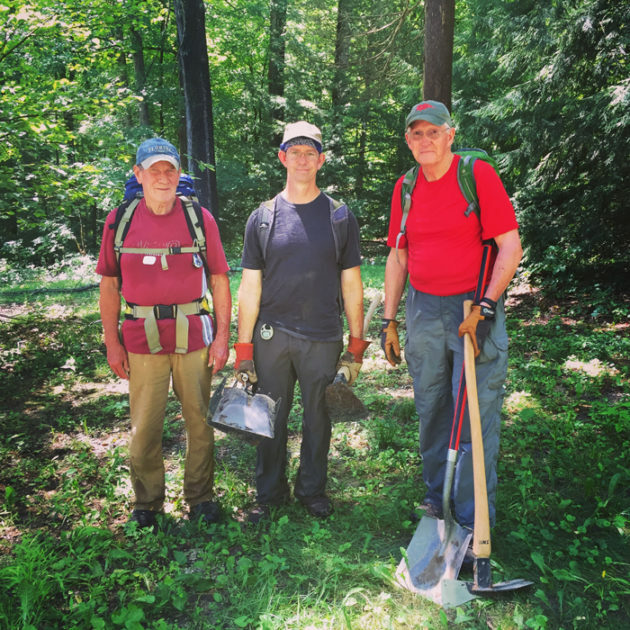 Pete Banta, James Shearn, Tom Connor, and Sara Mercado are volunteers for the Hoosier Hikers Council (HHC), an all-volunteer nonprofit that builds and maintains trails across Indiana. Along with others, these four volunteers have been coming every Monday morning to Sycamore Land Trust properties to add on to hiking trails. One such trail is a four-mile loop at the Laura Hare Nature Preserve at Downey Hill, a 600-acre Sycamore property near Nashville, where Jim Ferguson and his wife Andrea volunteer as property stewards for Sycamore. The north half of the trail is already open to the public, and can be accessed from the parking lot on Valley Branch Road. This Preserve is known for its steep hills, brilliant fall colors, and seasonal ponds. Pete Banta, a retired systems analyst for a manufacturing company, has been part of the HHC for 20 years. It started when he went on a service trip with the Sierra Club and fell in love with trail building, which provided anice break from his office job. He heard about HHC and got involved right away. As you can imagine, building a trail is tough work. From the careful planning stages through breaking ground and the countless whacks of tools into the earth, this is not a project to be undertaken without determination. But seeing it through to the end is a reward in itself. Anyone with any level of experience is welcome to join these projects. It’s a great way to get exercise, contribute to the future of our community, and meet some really interesting folks. See the events listing in this issue for details. This dedicated service is the reason we have chosen to honor the Hoosier Hikers Council with this year’s Volunteer of the Year award, which was given at our 26th Anniversary Annual Celebration on Friday, October 21. We are always grateful for the work the HHC does for Sycamore and across the state, and look forward to future collaborations with them. For more information, visit www.hoosierhikerscouncil.org.